Have you aggravated a telemarketer today? Is this one case where robots *should* take over a job? Anyone who's ever shaken their head over the utterances coming out of Donald Trump's mouth will surely be glad to know that they're now being improved with deep learning. The only catch: It's not Trump doing the learning, but rather a Twitter robot. 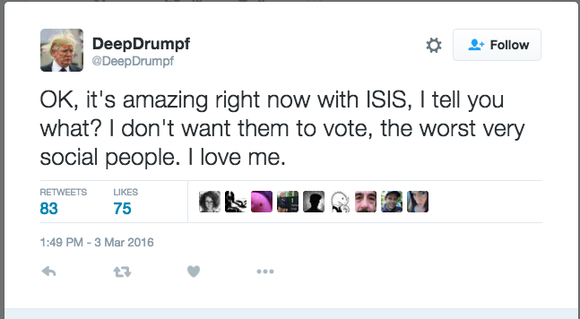 DeepDrumpf is a Twitterbot created by a postdoctoral researcher in MIT's Computer Science and Artificial Intelligence Lab that uses a deep-learning algorithm to make even Trumpier statements than Trump himself. Based on an artificial-intelligence algorithm trained on transcripts of Trump’s victory speeches and debate performances, the bot shows a remarkable proficiency for taking the hyperbole even further. A tweet from MIT's DeepDrumpf Twitterbot. "I'm what ISIS doesn't need" is one creation of the bot, for example. "Great manufacturing, bring back our jobs, bring back our manufacturing, because my file, you know, I don’t need anybody’s money. ..." is another. The bot creates its tweets one letter at a time, apparently following Trump’s campaign slogan, “Make America Great Again." So, if the bot begins a tweet with the letter “M,” that's "somewhat likely to be followed by an 'A,' and then a 'K,' and so on" until the bot types out that slogan, MIT explains. It then starts over for the next sentence and repeats the process until it reaches Twitter's 140-character limit. Inspired in part by an existing training model that can simulate Shakespeare, the Tweetbot’s creator -- MIT CSAIL postdoc Bradley Hayes -- used techniques from deep learning to create it. “Trump’s language tends to be more simplistic, so I figured that, as a modeling problem, he would be the most manageable candidate to study,” Hayes said. “The algorithm essentially learns an underlying structure from all the data it gets, and then comes up with different combinations of the data that reflect the structure that it was taught." A word of caution: DeepDrumpf’s tweets don’t always make complete sense. But then, that's just about right.